What’s the difference between Epidiolex and other CBD products? Families whose children suffer seizures from epilepsy have asked legislators in several states to “legalize” cannabidiol (CBD), “medicinal” marijuana, and “whole-plant extracts” so they can use them to reduce their children’s seizures. The marijuana industry has been happy to accommodate, helping parents lobby legislators and, when successful, producing CBD products. This week, FDA approved Epidiolex to treat two forms of epilepsy in patients ages 2 and older. Epidiolex is an extract of marijuana called cannabidiol (CBD) that is purified and delivers a reliable, consistent dose. Clinical trials proved it reduces epileptic seizures. Now families have a choice. They no longer need to risk giving their children unregulated products that may harm their already fragile health. • Patients buy at pharmacies. • Likely to be insured. • Unpurified extracts containing up to 20% CBD, THC, other components. Some are contaminated. • Patients buy at dispensaries. 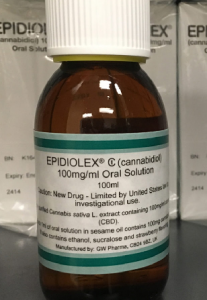 Many media outlets are reporting that FDA’s approval of Epidiolex means CBD will be placed in a lower schedule of the federal Controlled Substances Act. But FDA Commissioner Scott Gottlieb clarifies, “This is the approval of one specific CBD medication for a specific use . . . based on well-controlled clinical trials evaluating the use of this compound in the treatment of a specific condition.” Just as Marinol, Cesamet, and Syndros, FDA-approved forms of THC, are in lower schedules but THC remains in Schedule I, Epidiolex is likely to be placed in a lower Schedule while CBD likely will remain in Schedule I. Commissioner Gottlieb says FDA continues to support rigorous scientific research into potential medical treatments using marijuana or its components but is concerned about the proliferation and illegal marketing of unapproved CBD-containing products making unproven medical claims. FDA will continue to act to end such behavior, he says. Action is certainly needed. Searching for CBD Oil on Amazon brings up 929 results. All unregulated.